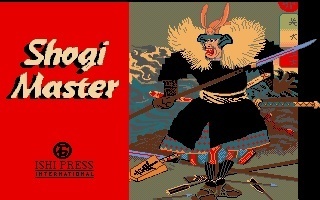 Shogi Master is the video game version of the Japanese Chess game Shogi developed and published by Ishi Press International in 1991 for DOS only. 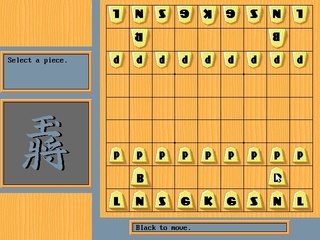 Shogi is also known as the Game of Generals and is a strategy board game pitting 2 opponents against one another. 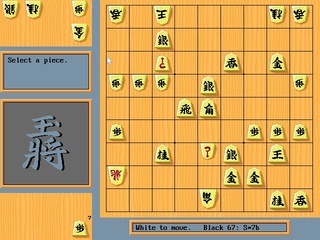 Unlike the original Chess, Shogi allows a capturing player to “free” a captured piece, thus returning it to the game board, but switching it to their own side. Shogi uses more pieces than traditional chess, moving up to 20 pieces per player. The pieces are laid out on the board somewhat similar to chess, but with 3 used rows rather than 2. 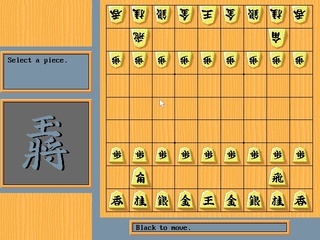 Shogi features a full set of rules for moving each piece and claiming victory. 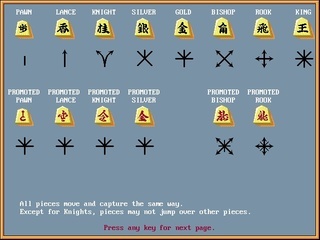 You’ll most likely need to get your bearings before you can take on the computer, but the game allows for the use of either English or Japanese text on the pieces. 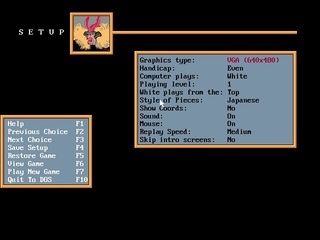 There was also a recording feature so you could revisit previous games and moves. Shogi is an interesting adaptation of traditional Chess and takes it to a new level. I was never much of a fan of Chess, though I otherwise love strategy games. Chess lovers and strategists alike can take this opportunity to learn a new game. Know a thing or two about Shogi? Drop some tips for the newbies below!